When it’s this vital to our health, happiness, and success, why aren’t we all developing this critically important skill every day? It’s as important as a balanced, healthy diet, yet most people neglect it completely. Please take just a moment to consider this important message about it. During most of the day when you’re working, texting, emailing, driving, or doing anything active, your brain waves are primarily in a Beta pattern. But, if you want to find a creative solution to a problem, receive insights or breakthrough ideas on a challenge you’re facing, increase the natural balance of your body, or eliminate stress, your brain needs to slow down to a Theta-Alpha pattern. These types of patterns occur when you’re relaxed and reflective (but not sleepy), or in a state in which a silent current of thoughts, images, and memories emerge spontaneously in your mind. The problem is, with updates and news coming at you by the minute, and distractions and temptations just a keystroke away, it can be very difficult to achieve these slower brainwave patterns during the course of a normal day. The result? You often feel overwhelmed and off balance. How can you slow down your brain waves even when you’re surrounded by chaos and stimulation? By developing your mental focus. Mental focus enables you to shut out the noise that almost always surrounds you; it allows you to get calm in the center of a storm. It is the single best tool you have for releasing the power of your mind and allowing the answers, breakthroughs, and insights you seek to be heard. It also helps you relax, relieve stress, and build up your immune system. No pill, herb, or food on earth can do all of these things. The best way to develop laser-sharp focus is to meditate. Meditation — in all its various forms — is supported by decades of scientific research and backed up by centuries of real-life experiences. It is proven to help you let go of all the content that generally occupies your consciousness by slowing down your brain waves. With your mind clear, you can access the knowledge that’s locked inside. The most successful, happy, and well-balanced people all have the power to focus their minds. By developing a focused mind, these individuals have been able to rise to incredible levels of achievement in just about every field. But, slowing down your brain waves to have a focused mind can be challenging — even for the experts! That's especially true with the stresses and constant stimulation of modern life. Now, more than ever, you need to develop ways to gain instant access to the calm, all-knowing haven that’s inside your mind. According to the Mayo Clinic, meditation can be the doorway to innovative thinking, knowing, being healthy, finding calm inner strength, and... quite frankly... living happily and productively in this world. And — contrary to what you may think — you can meditate almost anywhere... even when you’re driving! Every answer you seek is already inside your mind. If that is true, how do you get to those answers and insights when you need them? If the genuine solutions and guidance you need are already in your mind, why are they sometimes so darn difficult to find? As hard as it can be to access this genuine information, every now and then the knowledge and insights just come to you like magic. Why doesn’t that happen more often? Or, more importantly, how can you make it happen at your command? The reason you get stuck has little to do with what’s in your mind. The problem is with what’s not in your mind. The electrical activity of the brain is measured in terms of “waves.” That means if you hook your head up to a machine that measures the electrical output of your brain, you'll see it form a wave on the screen. Your brain produces five basic types of waves. They're called Delta, Theta, Alpha, Beta, and Gamma. While this sounds like a college fraternity, it's really a measure of how fast or slow your brain is working at any given time. And that's why we're so excited to introduce a comprehensive program called Focused Mind, Powerful Mind: Releasing Your Mind's Greater Powers with Advanced Meditation Techniques. Yes, I want to re-create my life in nearly any way I choose by tapping the greater powers of my mind! Most people think meditation is a technique to empty the mind. It's true that that is sometimes the goal. But meditation can do much, much more than empty your mind. Meditation is a mental practice that trains your mind to attain any specific benefit—everything from getting a good night's sleep to building wealth. First, it gives you step-by-step instructions for changing the content of your mind to achieve a variety of specific benefits. Instead of just sitting in a pretzel position to reduce stress, you'll actually be applying the ideas and techniques right away so you can start seeing more of the benefits of meditation as quickly as possible. It doesn’t just teach you how to set aside time to do different meditation techniques, but it provides a system you can use in the real world to train your mind so you’ll be able to shift into the appropriate brain-wave and mental states on demand. Meditation is not complicated to learn; it can be practiced anywhere, at any given moment; and it’s not time consuming — most important of all, it’s a must-learn skill in this hyperactive day and age. In fact, you can see incredible results from meditating just 15 to 20 minutes a day. Best of all, meditation has NO negative side effects. Bottom line: There is nothing but good to be gained from it! Focused Mind, Powerful Mind is an advanced mind-development program that is based on the meditation techniques and mental exercises of some of the greatest thinkers of all time. 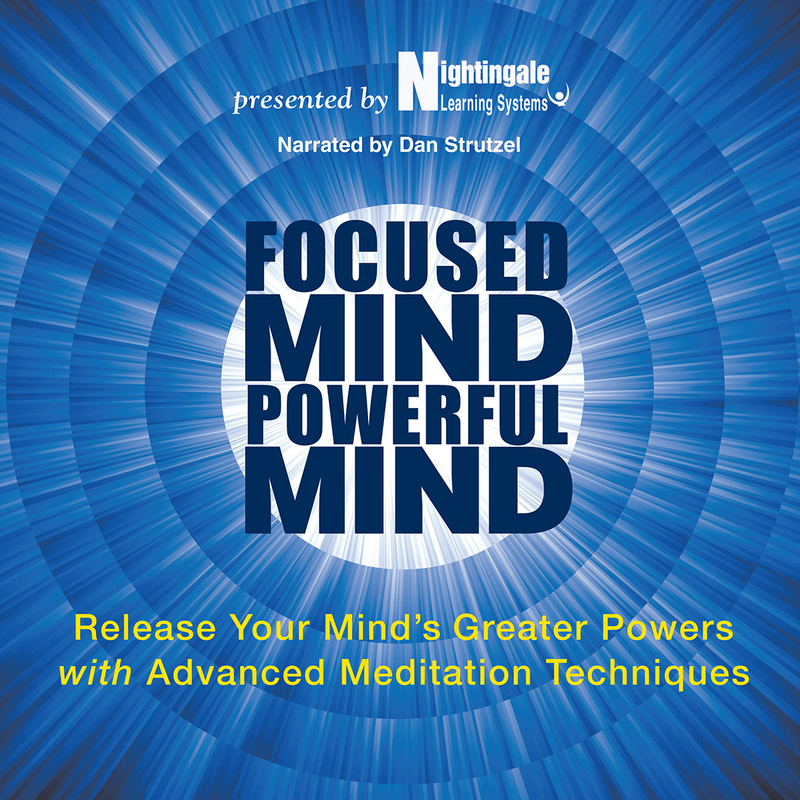 Whether you're a beginning meditator or a seasoned practitioner, it provides useful step-by-step techniques for tapping the greater powers of your mind and using them to live happily, productively, and abundantly. In addition to learning how to do more than a dozen techniques (including some guided meditations), you'll also learn about 12 Meditation Masters. These are people, past or present, who used or use meditation to achieve remarkable success in their given field. In some cases, the Meditation Master has given us actual tips and techniques specifically for this program. In other words, you're getting information from these Masters that isn't available anywhere else! We're exceptionally excited about this program because it underlies everything we do at Nightingale-Conant. If you’re serious about living life to the fullest, it all starts with mental focus. The reason meditation is so powerful is because you become what you think about. When you meditate, you clear away all the noise and the clutter, and your thoughts become focused and clear. So, because you become what you think about, your life automatically improves through meditation. When we get your order, we'll immediately ship you the full program. You'll get 12 remarkable audio sessions on 6 CDs, plus a Writable Meditation Insights Journal to write down any thoughts and breakthroughs you have while completing the exercises. And to give you every opportunity to succeed, we'll also send you two bonus CDs. The first CD includes a guided relaxation technique that can be used as a standalone meditation or as a “warm up” to one of the two additional meditations on the CD. One meditation technique helps you lose weight, and the other helps you create financial abundance. The second bonus CD contains five Clearing Exercises: The Failure Buster, The Inner Child Exercise, The Limiter Lifter, The Should Shifter, and Releasing Relationships. These exercises are accompanied by a writable PDF workbook in which you can write your thoughts as you're going through each clearing exercise. I look forward to receiving your order, sending you this remarkable program, and hearing about the miraculous ways your life improves after you start honing the powers of your mind. I have no doubt that this program is your path to getting you where you want to go, and far beyond. P.S. You may think you don't have time to meditate. But not taking the time to focus your mind is simply a lack of motivation. You're not taking the time because you don't understand the value of meditating or because you haven't experienced its full benefits. I guarantee that if you make it a routine, even for just 15 minutes a day, you'll never have a problem with motivation again. More importantly, you'll never again have to wonder how to access the powerful insights and knowledge that are already inside of you. Order Focused Mind, Powerful Mind today!